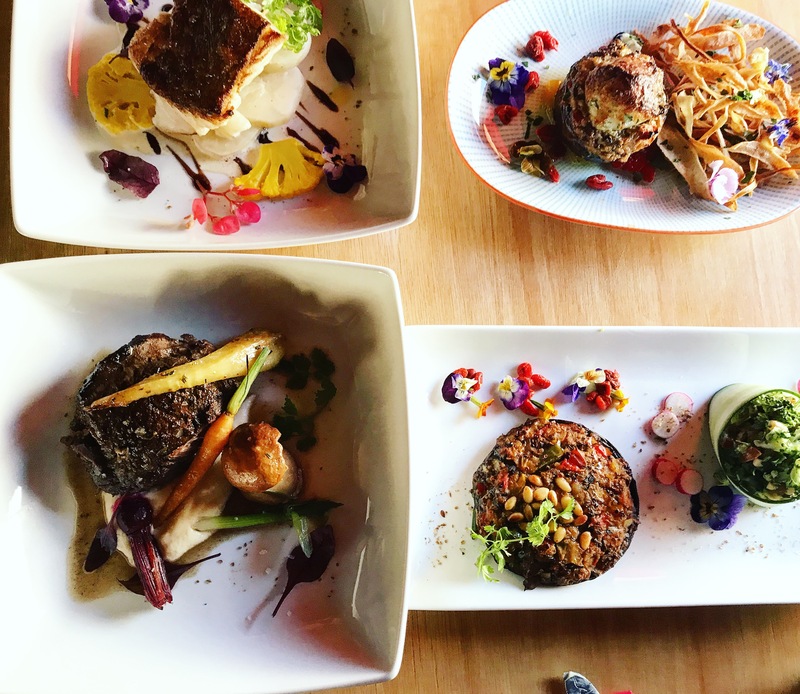 Constantly in search of the next novel experience in London, we just found the first of its kind at TWID, in Battersea.”That’s What I do,” is a fun, dining experience that sees you immersed in live opera. Behind the facade of a converted pub, a peek through the curtains, and you are transported into what appears to be an almost, traditional theatre. There’s something rather exciting about going up the small set of stairs to the private opera boxes. 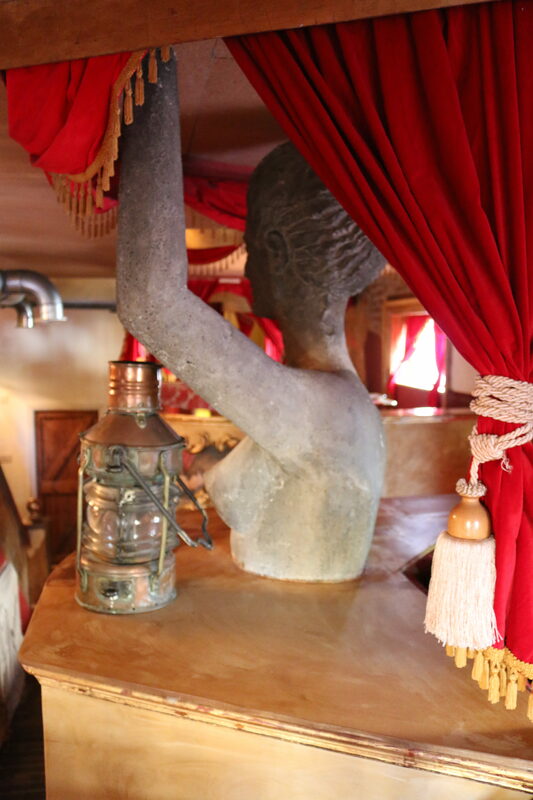 There are interesting stone statues scattered around the restaurant, and clearly a lot of thought has gone into the décor, at first glance. 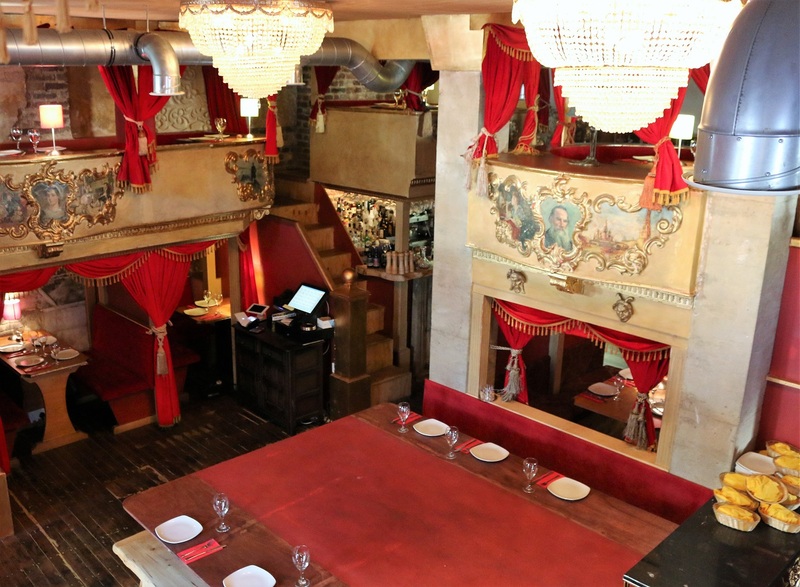 By light of day, the décor is a bit rough around the edges, but as night falls it’s easier to look past the chipboard ceiling and appreciate the romantic booths, and the atmosphere that’s been created. 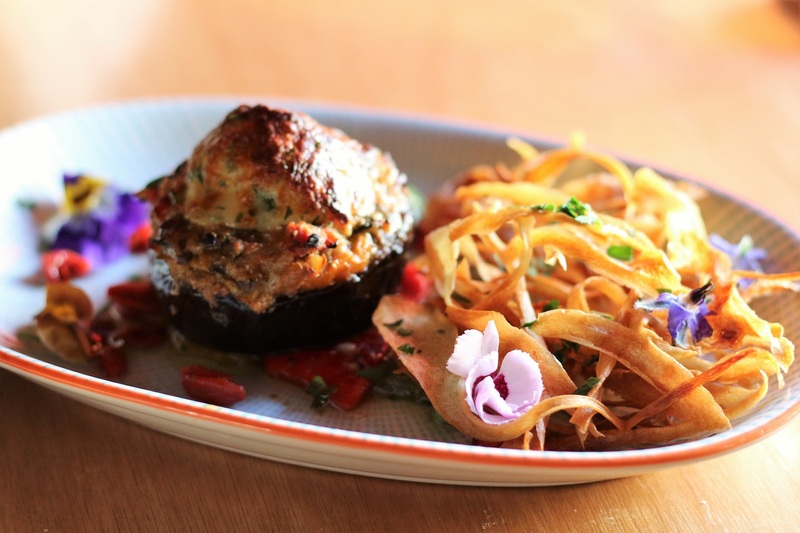 The menu has a nice selection of small plates to choose from, that are ideal to share. They are actually far from small, and rather substantial dishes, and probably no more than five would suffice for two. There’s a call bell on the table, which is genius- if only every restaurant had this. 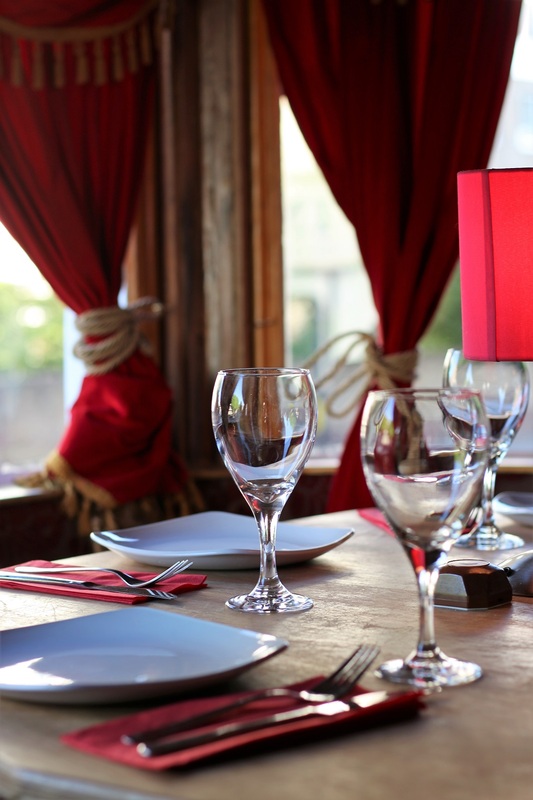 It allows the experience to be private and intimate whilst maintaining attentive service. 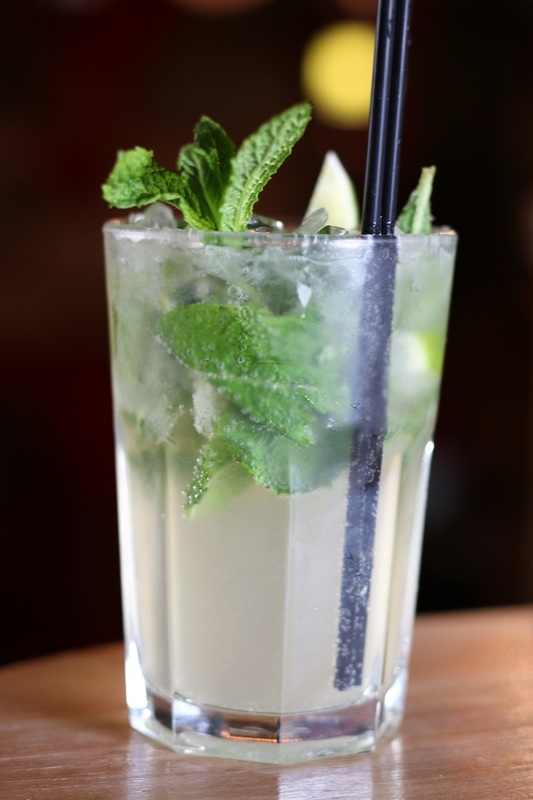 Sipping on a mojito is always the best way to start the evening. Following the a basket of bread, the small plates started arriving quite swiftly. 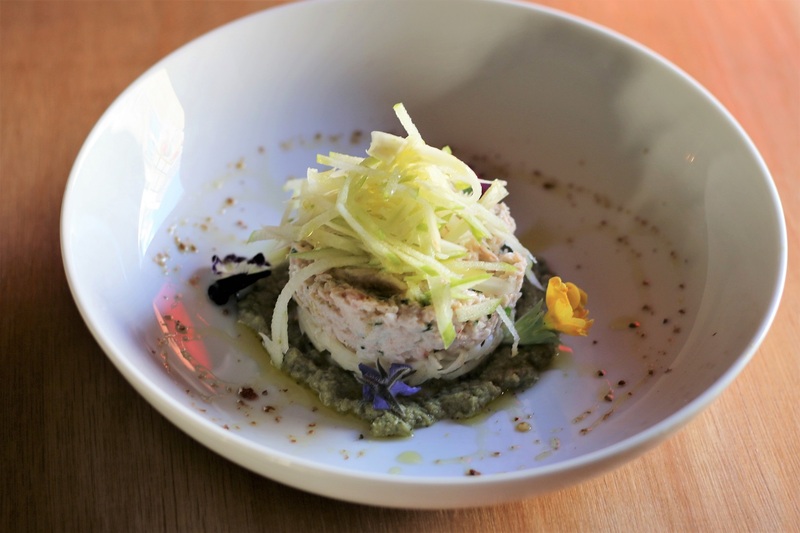 The hand picked crab was topped with julienned apple, fennel, on a bed of Basil. 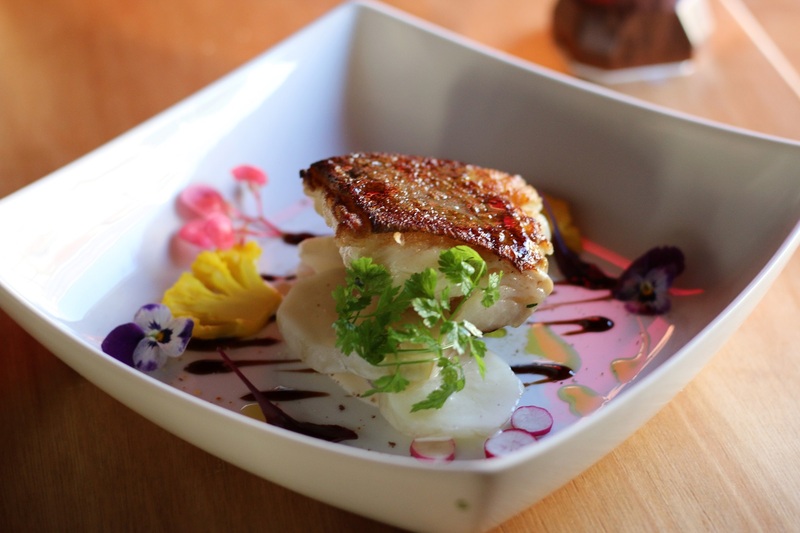 The cod was perfectly cooked and served with potato, a floret of cauliflower and colourful flowers. 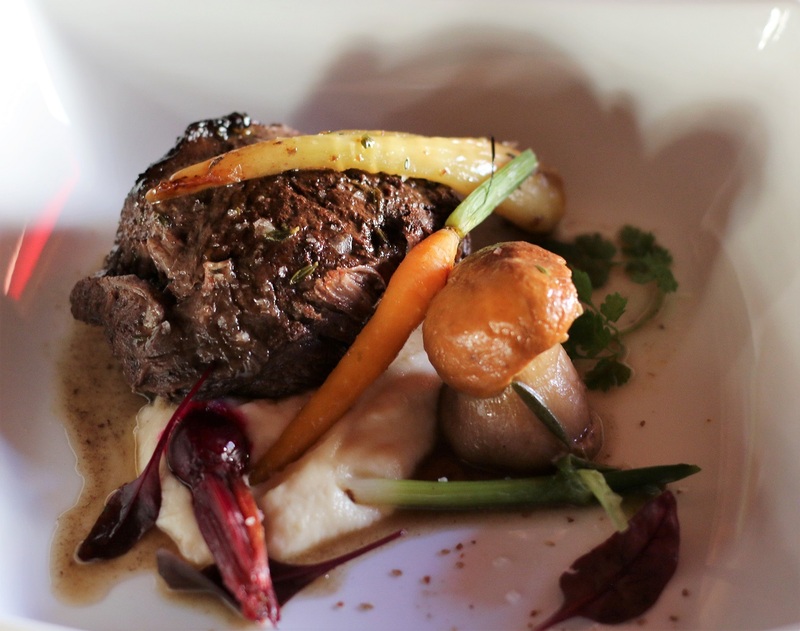 The ox cheek was tender and served with a medley of vegetables, cepes,and Celeriac puree. 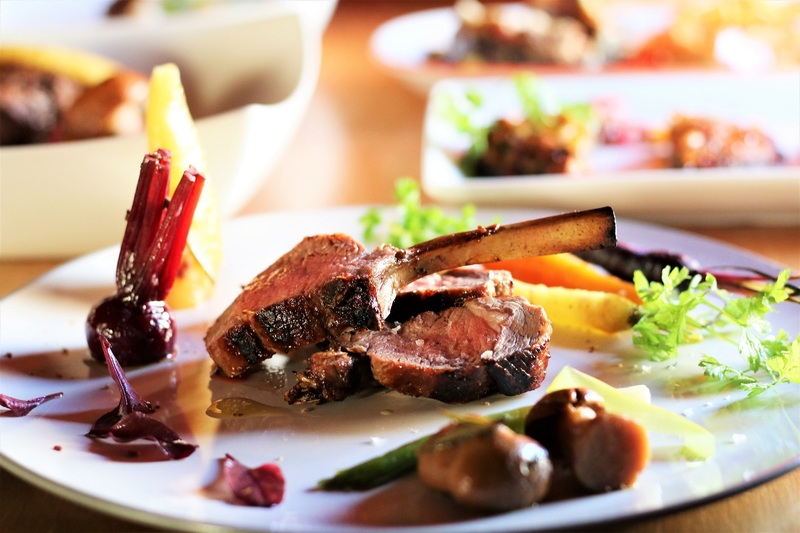 The lamb cutlets were served with a scattering of heritage beets and parsnip. The large, flat mushroom was loaded with quinoa, pine nuts, and basil was served with a fresh, green broccoli parsley salad encased in slithers of cucumber. The aubergine topped with goats cheese and walnut, was packed full of flavour. 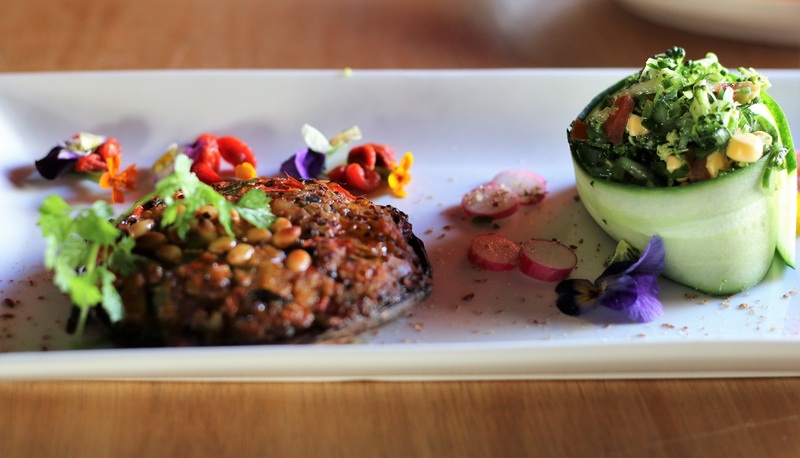 Each dish has been meticulously presented, with finesse, and adorned with edible flowers. The plates were undoubtedly pretty in appearance, and the vegetarian plates were delicious, and whilst the meat dishes were promising, seemed to lack a depth of flavour. 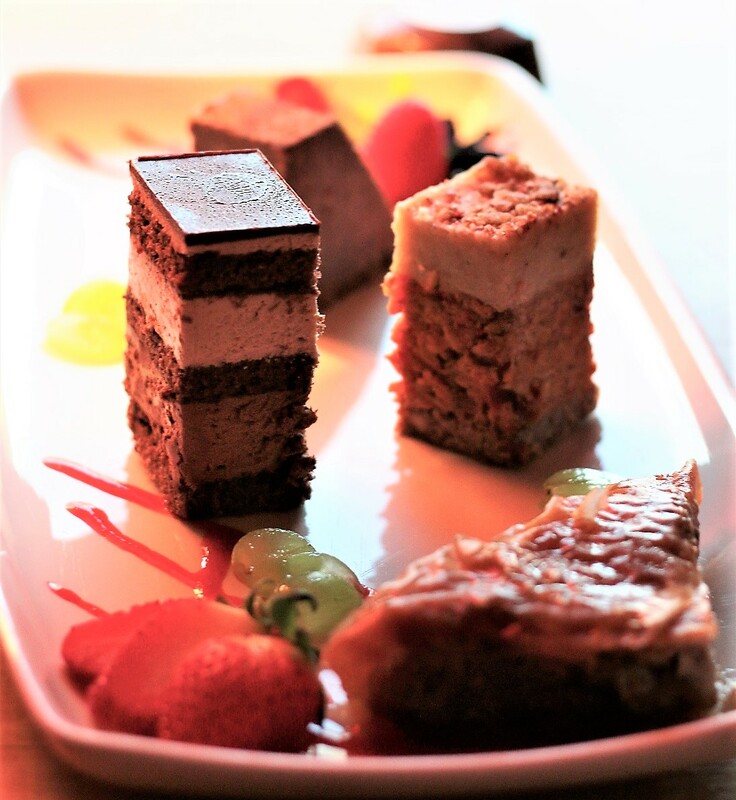 The tasting platter of desserts is a great way to savour a selection of desserts. However, we could have quite easily skipped the carrot cake, baklava and chocolate cake, for a whole portion of the layered salted caramel cake. 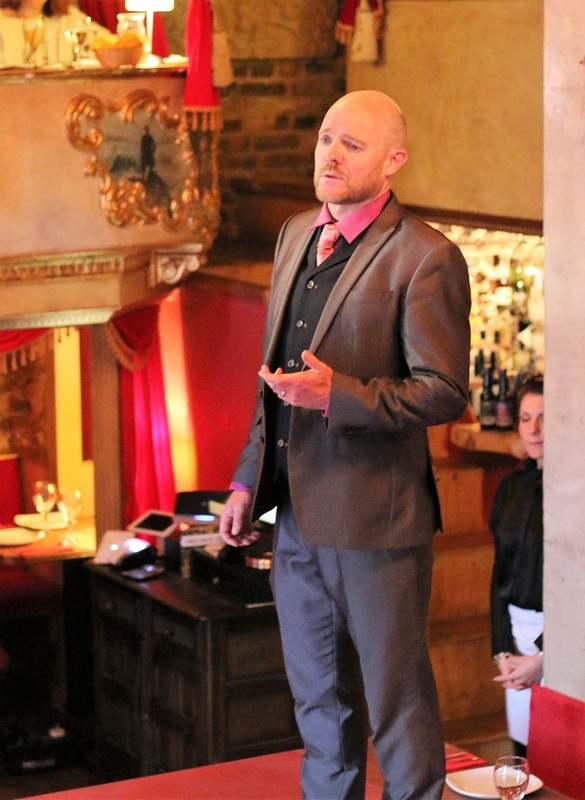 An evening at TWID is perfectly interspersed with opera and renditions from “My Fair Lady,” by a charismatic singer. The live entertainment had all the drama of an opera. The opera singer had a great energy, as he worked the audience, and briefly joined unsuspecting couples in their private booths. 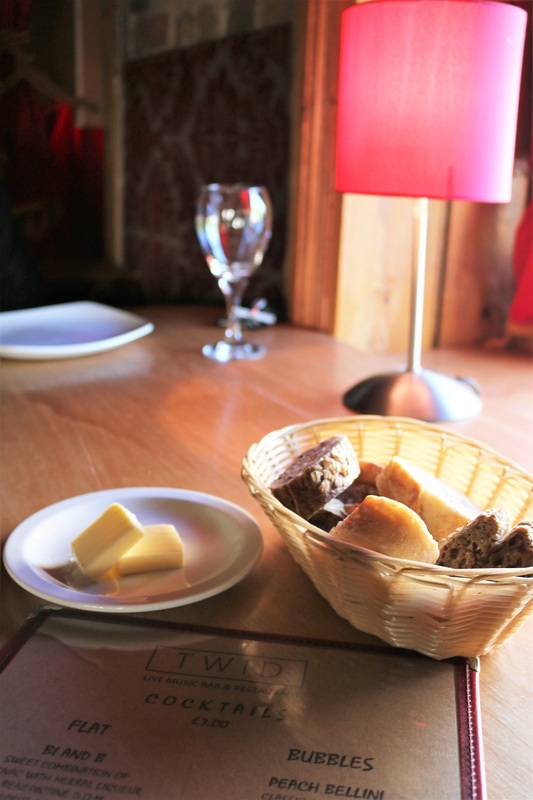 TWID is quirky and charming and perfect for a romantic date, if you don’t mind your partner being serenaded by the opera singer. TWID is a novel concept for London, and we liked it! It’s most definitely a memorable dining experience, that would be great for an anniversary or even a small group celebration.